The 360 Connection zip means you can zip the jeans to any RST jacket. 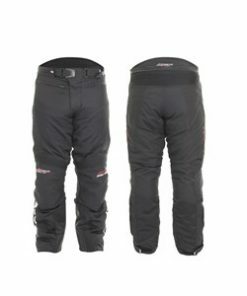 Additional features include reflective details, stretch comfort panels and an adjustable waist plus max zips. By purchasing this genuine RST VENTILATED BROOKLYN J 1195 from Biking Direct, you are purchasing via an authorised RST distributor. We only sell GENUINE RST Products so you can have peace of mind. We ship our products via a next day courier service and our RST products are dispatched the very same day where possible. Our next day service is offered Monday to Friday however we do also offer a premium Saturday delivery service for those parcels that you just need to have. Our customer care goes above and beyond, and if you are not completely satisfied we will go out of our way to help you get the outcome you desire. Our friendly staff are available on the phone, via text or you can just use our contact form. We aim to respond to all queries within 24 hours. You can find out all our contact information here. Whether its developing our own armour system, sourcing new and unique materials, thread or zips, or producing innovative products such as the RST VENTILATED BROOKLYN 1195 J, if there is a better way to do something the team is always striving to push forward and improve. Buy with confidence, buy with Biking Direct.